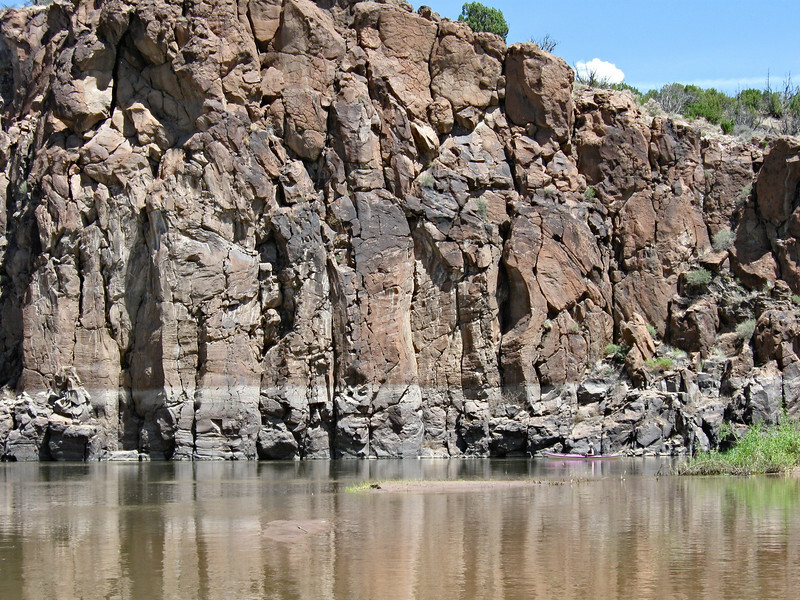 Most of our kayaking trips begin at the Tetilla Peak boat ramp on Cochiti Lake. We then head north into the Rio Grande, where there are virtually no traces of any kind of human activity because this part of the river is either on pueblo land or Bandelier National Monument. The river has lots of sandbars and mudflats, which make navigation somewhat tricky, and often we are paddling upstream against current and back home with headwinds. We always see many Great Blue herons, turkey vultures, ravens, redwing blackbirds, Black and Say's phoebes, and spotted sandpipers. Other bird sightings have included Green and Black-crowned Night herons, Snowy and Great egrets, white pelicans, ospreys, Western and Pied-bill grebes, mergansers, mallards, teal, coots, Canada geese, Red-tail hawks, kestrels, Peregrine falcons, and an occasional bald eagle late in the season. Wildlife includes beaver, muskrats, wild mustangs, a few coyotes, and rarely, river otters, in addition to chimpmunks and ground squirrels. The rock formations, wildlife, stillness, and solitude make for deeply satisfying, often epiphanous experiences. The feeling of oneness with Nature and the elements is unsurpassed. Many of the photographs are documentary, in that the river has changed enormously in our 18 kayaking seasons. For example, many canyons that were navigable only five years ago are now filled with sand, and there are numerous sandbanks and mudflats where formerly the river ran free, strong evidence of climate change. Most of the photographs were taken with a 2009 Canon compact digital camera (8 megapixels). Although the detail and image quality of these is not nearly as good as with my usual gear, the photographs hopefully convey the beauty and vastness. I recently purchased a Fuju X30 to replace the Canon. There is already a great improvement in the quality of the photographs. These are at the end of the gallery images, beginning with #52.